Geri Radacsi has been a journalist, English teacher and corporate communication specialist. Currently, she is associate director of university relations at Central Connecticut State University, New Britain,CT. Her publishing credits include The Atlanta Review, ELF, Embers, Comstock Review, Connecticut Review, Connecticut River Review, MacGuffin, Potato Eyes, Santa Barbara Review, Rockford Review, the Southern Humanities Review, Plainsongs, Poetry Motel, The Sycamore Review. 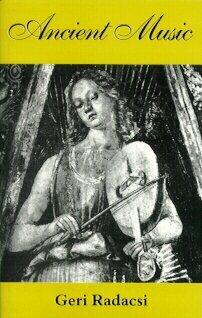 She has appeared in the regional anthology Our Common Voice: The Greater New Britain Poets. Her poem, Musetto Cookies, was nominated for a Pushcart Prize. She resides with her husband and daughter in Farmington, CT.
"Ancient Music begins with the human body--in the flesh, in the Sistine Chapel, on the walls of caves, in archaeological digs, everywhere--and proceeds outward from it in all its beauty and vulnerability to make observations which are true because they are presented in dazzling language and gripping images. 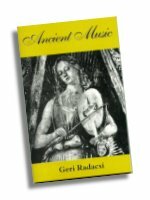 Ancient music indeed, yet Geri Radacsi's poems are as conmtemporary and inevitable as tomorrow." like a snail spiraling upward. of the skys immense calculations. bear, and from the dipper, he cools his tongue. each night he catches the moon-disc. and spaces of his own universe.